The Earth is still reeling from an attack by a hostile alien race called the Formics. If it hadn’t been for the actions of International Fleet Commander, Mazer Rackham (Ben Kingsley), all would have been lost. To prevent another attack, Colonel Hyrum Graff (Harrison Ford) and the International Military are training the best young minds in order to find a leader like the now legendary Rackham. Graff believes that he has found a candidate in Ender Wiggin (Asa Butterfield), a withdrawn and yet strategically brilliant young boy who could be the world’s greatest hope of future survival. Subscribe To 500 Days Of Film And Never Miss A Review! 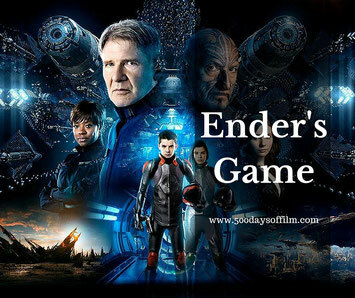 I missed Ender’s Game when it was released in cinemas in 2013. I am not quite sure why it has taken me three years to watch this movie. Was it the reviews that the film received? Possibly - some were, well, lukewarm. Was it because the movie is based on the novel by Orson Scott Card - an American author who has expressed some extremely inflammatory and frankly ludicrous views. Maybe. Whatever the reason, I decided to watch Ender’s Game this week because it was directed by Gavin Hood whose new film, Eye In The Sky, I watched (and loved) last week. Although I am obviously very late to the party, I am happy to report that I enjoyed Ender’s Game. This is an intelligent science fiction film with a particularly impressive cast. Asa Butterfield (Hugo) gives a powerful performance as Ender. He more than holds his own in his scenes with Harrison Ford. Butterfield is particularly effective in his portrayal of Ender’s anger and determination. There is a real sense of rage in his eyes and he is not afraid to use all of his skills to fight back against his bullies (this film features some pretty violent scenes). While I was less convinced by Ben Kinsley (something about his accent maybe), I really enjoyed Hailee Steinfeld’s (True Grit) portrayal of Petra Arkanian. Hers is an engaging screen presence. My only issue with Enders Game is that it feels a little too dense at times. There were moments when the film seemed to struggle with all of its themes. In addition, while the film doesn’t drag exactly (although, at 114 minutes, this is not a short movie), it does have pacing issues. However, my reservations disappeared as Ender’s Game moved into its final act. With a stunning twist, the film moves to a genuinely thought provoking conclusion. Have you seen Enders Game? If so, what did you think about this film? Do let me know what you think of this movie - why not leave me a comment in the box below?